Do you remember that just three decades ago, South Africa was still gripped by a cold-hearted security state that spared nothing in its bid to maintain power and enforce white minority privilege? That government oversaw massacres, assassinated opponents and locked up and tortured activists – including children. It is hard to imagine in this day and age, when we now take human rights for granted. So, it is good to be reminded that it was not that long ago that we were in that Hades. Two books this year so brilliantly transported us to that time and remind us of the personal sacrifices that were made to dislodge one of the most evil systems of the modern era. My Father Died for This – by Fort Calata’s son, Lukhanyo, and his wife, Abigail – is a searing personal story and a history lesson. Lukhanyo, now a senior and prominent journalist, was a toddler when his father – one of the anti-apartheid activists who became known as the Cradock Four – was killed by the state. The book not only takes us back to the ugly and turbulent 1980s, but it is also a personal journey of a son forming a bond with a father he got to know only through legend. 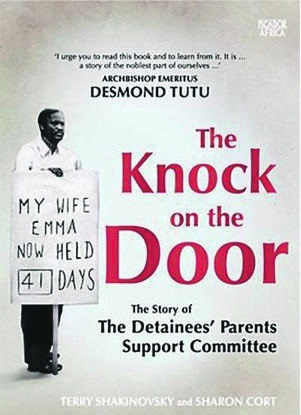 Similarly, The Knock on the Door reminds us of the human impact of apartheid repression on families and the role played by unheralded individuals in the struggle against apartheid. Formed to tackle the plight of children and young people detained by the security forces, and to give support to their families, the Detainees’ Parents Support Committee (DPSC) morphed into a much more potent weapon than it was initially meant to be. It thrust parents who were not even very politically aware into frontline activism, and its voice was heard in world capitals. The title may say this book is about the history of the DPSC, but it is more than that. It is about the nitty-gritty of the 1980s, the mass movement of that time and the courage and energy of ordinary South Africans. These two books may not be the blockbuster epics that walk away with multiple awards, but they are important histories of one of the most compelling revolutions of the 20th century.